Make Crust: Mix crust ingredients together and press into a 10-inch springform pan. 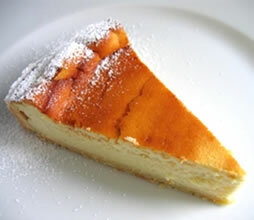 Make filling: Beat cream cheese, Splenda Granulated Sweetener and flour in a medium bowl until well mixed and smooth. Add eggs and egg yolks, beat until smooth. Add vanilla. Scrape sides of bowl. Mix briefly and add heavy cream. Mix until well blended. Pour filling over crust. Bake 10 minutes at 475 degrees F. Turn oven temperature down to 200 degrees F and bake for 1 hour. Turn oven off and leave cheesecake in the oven for one more hour. Cheesecake will be slightly firm to the touch. Let cool 15-20 minutes before placing in the refrigerator. Refrigerate a minimum of 4- 6 hours or preferably overnight before serving. Recipe Yield: Yield: 16 servings.``Serving Size: 1 slice.